Spectrasonics Trilian is now shipping ! After many years of development, Spectrasonics is proud to release the brand new virtual instrument Trilian®, the long-awaited successor to the award-winning Trilogy bass module. 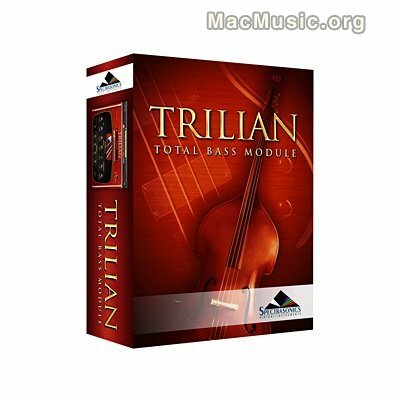 Trilian's massive 34GB core library featuring highly-detailed new Acoustic, Electric and Synth basses - as well as enhanced versions of the classic Trilogy sounds. With a brand new user interface and numerous software innovations, Trilian is the first 64-bit native software based on Spectrasonics next generation STEAM Engine, and is the first virtual instrument to feature full library integration with the flagship Omnisphere synthesizer. Trilian is now shipping, and the MSRP is $299/€229. All Trilogy customers can upgrade to Trilian for $99. There is also a special FREE upgrade offer for Trilogy customers on the Intel-Mac platform and for customers who purchase Trilogy in 2009.